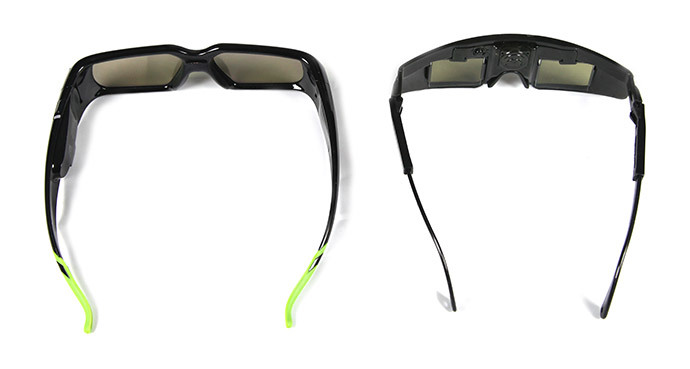 Not that the shutters on eDimensional’s glasses are almost square in form, where as the glasses from Nvidia are wider and this is because of big difference in time when the products were designed and first released on market. eDimensional’s 3D Vision glasses are quite old product, as far as I remember released 5 or even more years ago when the CRT displays with aspect ration of 4:3 or 5:4 were used almost everywhere. But now most of the new displays are widescreen with aspect of 16:10 and 16:9 so having wider shutters is not only good, but is actually a requirement in order to have the wide filed of view needed for the new LCD monitors. 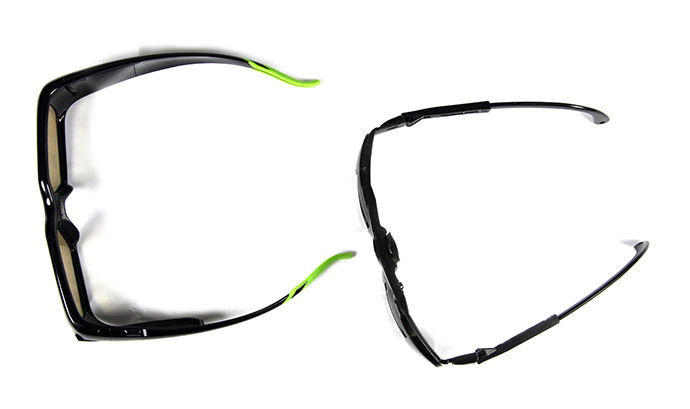 Another big difference is that eDimensional’s glasses use 2 lithium batteries for power that are not rechargeable and you have to replace them from time to time, although they last longer than the rechargeable battery available in Nvidia’s glasses. Anyway with up to 40 hours on a single charge and an easy and widely used mini USB connection for recharging there is not much to complain about Nvidia’s 3D Vision glasses. Here I have not provided pictures of the IR transmitters of the two types of wireless shutter glasses, but you should know that eDimensional’s solution does not rely on USB connection and actually requires you to connect it between your video card’s output and the monitor you are using. And you can already guess that it utilizes an analogue DSUB15 video connector in order to do that and the drivers are supposed to do everything else. Now, when talking about drivers, eDimensional had a bit of an advantage, becuse they used their own drivers that were compatible with both ATI and Nvidia video cards, although the glasses also worked with Nvidia’s old stereo drivers. Currently eDimensional’s drivers are quite out of date and not very usable, and the newer stereo drivers from Nvidia no longer support them (along with many other older devices!). If you own eDimensional 3D Vision glasses or any other shutter glasses you may try to run them with IZ3D’s driver, but the success rate depends on a lot of factors and the results will still not be as good as when using Nvidia’s 3D Vision. Not to mention the fact that if you intend to use the IZ3D driver (besides just quick testing) with something else than their 3D displays you’ll have to buy a license and the shutter glasses support that is currently available is still not very good, so don’t get your hopes too high.